Aguilar A, Pinto JA, Araujo J, Fajardo W, Bravo L, Pinillos L, Vallejos C. Control of cervical cancer in Peru: current barriers and challenges for the future. Molecular and Clinical Oncology. Balko JM, Schwarz LJ, Luo N, Estrada MV, Giltnane JM, Dávila-González D, Wang K, Sánchez V, Dean PT, Combs SE, Hicks D, Pinto JA, Landis MD, Doimi FD, Yelensky R, Miller VA, Stephens PJ, Rimm DL, Gómez H, Chang J4, Sanders ME, Cook RS, Arteaga C. Triple-negative breast cancers with amplification of JAK2 at the 9p24 locus demonstrate JAK2-specific dependence. Sci Transl Med 2016;8:334ra53. Araujo JM, Prado A, Cardenas NK, Zaharia M, Dyer R, Doimi F, Bravo L, Pinillos L, Morante Z, Aguilar A, Mas L, Gomez HL, Vallejos CS, Rolfo C, Pinto JA. Repeated observation of immune gene sets enrichment in women with non-small cell lung cancer. Oncotarget (In press). 2016. Pinto JA, Araujo J, Cardenas NK, Morante Z, Doimi F, Vidaurre T, Balko JM, Gomez A prognostic signature based on three-genes expression in triple-negative breast tumours with residual disease. npj Genomic Medicine 2016;1. Moore HC, Unger JM, Phillips KA, Boyle F, Hitre E, Porter D, Francis PA, Goldstein LJ, Gomez HL, Vallejos CS, Partridge AH, Dakhil SR, Garcia AA, Gralow J, Lombard JM, Forbes JF, Martino S, Barlow WE, Fabian CJ, Minasian L, Meyskens FL Jr, Gelber RD, Hortobagyi GN, Albain KS; POEMS/S0230 Investigators. Goserelin for ovarian protection during breast-cancer adjuvant chemotherapy. N Engl J Med. 2015 Mar 5;372(10):923-32. Gómez HL, Pinto J A, Castañeda C, Vallejos CS. Current barriers for developing clinical research in Latin America: A cross-sectional survey of medical oncologists. Clin Res 2015;1:22-28. Vallejos C, Flores CJ, Aguilar A, Vigil C, Sarria G, Pinillos L. Survival of cancer patients treated at Oncosalud-AUNA. Eur J Cancer 2015;(51):S145-S146. Fonseca P, Mendoza J, Wainer J, Ferrer J, Pinto J, Guerrero J, Castaneda B. Automatic breast density classification using a convolutional neural network architecture search procedure. Proc. SPIE 9414, Medical Imaging 2015: Computer-Aided Diagnosis, 941428. Casado FL, Manrique S, Guerrero J, Pinto J, Ferrer J, Castañeda B. Characterization of breast density in women from Lima, Peru. Proc. SPIE 9416, Medical Imaging 2015: Image Perception, Observer Performance, and Technology Assessment, 94161B. Angulo A, Ferrer J, Pinto J, Lavarello R, Guerrero J, Castaneda B. Experimental assessment of an automatic breast density classification algorithm based on principal component analysis applied to histogram data. SPIE 9287, 10th International Symposium on Medical Information Processing and Analysis, 92870E. Morante Z, Araujo J, Fuentes H, Neciosup S, Gomez H. Phyllodes tumor of the breast, clinicopathological features and prognostics factors in a retrospective cohort with 7-year follow-up. [abstract]. In: Proceedings of the Thirty-Eighth Annual CTRC-AACR San Antonio Breast Cancer Symposium: 2015 Dec 8-12; San Antonio, TX. Philadelphia (PA): AACR; Cancer Res 2016;76(4 Suppl):Abstract nr P6-10-18. Vallejos C. Cancer Control in Peru: “El Plan Esperanza”- The Hope Plan. In: World Cancer Report 2014. International Agency for Cancer Research 2014. p. 584-85. Balko JM, Giltnane J, Wang K, Schwarz LJ, Young CD, Cook RS, Owens P, Sanders ME, Kuba MG, Sánchez V, Kurupi R, Moore PD, Pinto JA, Doimi FD, Gomez H, Horiuchi D, Goga A, Lehmann BD, Bauer JA, Pietenpol JA, Ross J, Palmer GA, Yelensky R, Cronin MT, Miller VA, Stephens PJ, Arteaga CL. El perfil molecular del cáncer de mama triple negativo residual luego de quimioterapia neoadyuvante identifica dianas terapéuticas acccionables. Molecular profiling of the residual disease of triple-negative breast cancers after neoadjuvant chemotherapy identifies actionable therapeutic targets. Cancer Discovery. 2014, 4:232-245. Pinto J, Prado A, Cárdenas N, Valdiviezo P, Neciosup S, Aguilar A, Sarria G, Zaharia M, Flores C, Mas L. El incremento de la susceptibilidad al cáncer de pulmón relacionada al consumo de tabaco en mujeres no se explica mediante la expresión de los genes de reparación del DNA. Increased susceptibility to lung cancer related to smoking in women is not explained by the expression of DNA repair genes. J Thorac Oncol 2014; 9(S3):P2.40. Mas L, Pinillos L, Vallejos C, Flores C, Pinto J, Suazo JF, Valdiviezo P, Aguilar A. Sobrevida global en pacientes con cáncer de pulmón tratados en Oncosalud – AUNA. Overall survival in lung cancer patients treated at Oncosalud – AUNA. J Thorac Oncol 2014;9(S3):P1.07. Moscol D. Taxa L. Aguilar J, Guerrero J. Oncocitoma renal gigante: un reporte de caso en Perú. Giant renal oncocytoma: a case report in Peru. JPR 2014. 02.008. Giltnane J, Balko J Kuba G, Schwarz L, Sanders M, Sanchez V, Pinto J, Doimi F, Gomez H, Ross J, Palmer G, Yelensky R, Cronin M, Miller V, Stephens P, Cook R, Arteaga C. La amplificación del gen MCL1 está asociada con la sobreexpresión de MCL-1 en cáncer de mama triple negativo. MCL1 Gene Amplification is Associated with MCL-1 Overexpression in Triple Negative Breast Cancer. USCAP 2014 Annual Meeting (Abstract #452434). Loi S, Denkert C, Salgado R, O’Hely M, Savas P, Beavis, PA, Darcy, PK, Combs S, Rimm DL, Giltnane JM, Estrada MV, Sanders ME, Cook RS, Wang K, Miller VA, Stephens PJ, Yelensky R, Pinto JA, Doimi F, Gomez H, Arteaga CL, Balko JM. Reduced tumor lymphocytic infiltration in the residual disease (RD) of post-neoadjuvant chemotherapy (NAC) triple-negative breast cancers (TNBC) is associated with Ras/MAPK activation and poorer survival. SABCS 2014 (PARA SER PRESENTADO EN DICIEMBRE). Schwarz LJ, Balko JM, Giltnane JM, Sanders ME, Wang K, Lin NU, Miller VA, Stephens PJ, Yelensky R, Pinto JA, Gomez H, Landis M, Chang J, Arteaga CL. Enrichment of janus kinase-2 (JAK2)-amplified tumor cell populations in triple-negative breast cancers (TNBC) during chemotherapy treatment. SABCS 2014 (PARA SER PRESENTADO EN DICIEMBRE). Giltane J, Balko J, Stricker T, Young C, Estrada V, Wagle N, Van Allen E, Mu X, Sanchez V, Farley J, Fitzgerald K, Graber A, Pinto J, Doimi F, Gómez H, Rizzo M, Julian T, Abramson V, Mayer I, Kelley M, Yenamandra A, Wheeler F, Sanders M, Garraway L, Meszoely I, Arteaga Cl. Reduced tumor lymphocytic infiltration in the residual disease (RD) of post-neoadjuvant chemotherapy (NAC) triple-negative breast cancers (TNBC) is associated with Ras/MAPK activation and poorer survival. SABCS 2014 (PARA SER PRESENTADO EN DICIEMBRE). Dennison JB, Molina JR, Mitra S, González-Angulo AM, Balko JM, Kuba MG, Sanders ME, Pinto JA, Gómez HL, Arteaga CL, Brown RE, Mills GB. Lactato deshidrogenasa B: un marcador metabólico de respuesta a la quimioterapia neoadyuvante en cáncer de mama. Lactate dehydrogenase B: a metabolic marker of response to neoadjuvant chemotherapy in breast cancer. Clin Cancer Res. 2013 Jul 1;19(13):3703-13. Contreras AC, Acosta V, Torres LG, Ferri N, López H, Marin E, Juan P, Gil ME, Pinto JA, Flores CF, Gómez HL. El tumor no palpable es un factor sustituto para la sobrevida libre de enfermedad en el cáncer de mama temprano. Non-palpable tumor is a surrogate factor for longer disease free survival in early breast cancer: Evaluation of a 23 years-Venezuelan cohort. Cancer Res 2013;73(24 Suppl): Abstract nr P6-06-41. Balko JM, Giltnane JM, Schwarz LJ, Sanders ME, Wang K, Harris LN, Lin NU, Miller VA, Stephens PJ, Yelensky R, Pinto JA, Gomez H, Arteaga CL. Las amplificaciones de JAK2 están enriquecidas en el cáncer de mama triple negativo (TNBC) luego de quimioterapia neoadyuvante y predicen un pobre pronóstico. JAK2 amplifications are enriched in triple negative breast cancers (TNBCs) after neoadjuvant chemotherapy and predict poor prognosis. Cancer Res 2013;73(24 Suppl): Abstract nr S6-01. Ferrer J, Castaneda B, Pinto J, Guerrero J. Nueva clasificación de la densidad mamaria basada en el Filtro de Nagao y segmentación de densidad a priori. A novel automatic breast density classification based in Nagao Filter and a priori dense segmentation. Conf Proc IEEE Eng Med Biol Soc. 2013;2013:4450-3. Levinson KL, Abuelo C, Salmeron J, Chyung E, Zou J, Belinson SE, Wang G, Ortiz CS, Vallejos CS, Belinson JL. EL Estudio de Prevención del Cáncer Cervical (PERCAPS): La tecnología que hace accesible al despistaje. The Peru Cervical Cancer Prevention Study (PERCAPS): the technology to make screening accessible. Gynecol Oncol. 2013 May;129(2):318-23. Levinson KL, Abuelo C, Chyung E, Salmeron J, Belinson SE, Sologuren CV, Ortiz CS, Vallejos MJ, Belinson JL. EL Estudio de Prevención del Cáncer Cervical (PERCAPS): investigación basada en la participación de la comunidad en Manchay, Perú. The Peru cervical cancer prevention study (PERCAPS): community-based participatory research in Manchay, Peru. Int J Gynecol Cancer. 2013 Jan;23(1):141-7. Pinto J, Valdiviezo P, Aguilar A, Flores C, Velazco R, Suazo J, Vallejos C, Gómez H, División de Investigación, Oncosalud- Auna. Lima, Peru. Genes involucrados en la transducción de la señal de TLR4 como factores pronósticos para la sobrevida luego de quimioterapia neoadyuvante con antraciclinas y taxanos en cáncer de mama invasivo. Genes involved in TLR4 signal transduction as prognostic factors for survival following Taxane-Anthracycline neoadjuvant chemotherapy for invasive breast cancer. European Journal of Cancer Vol. 49 Supplement 4, Pages S35-S36. 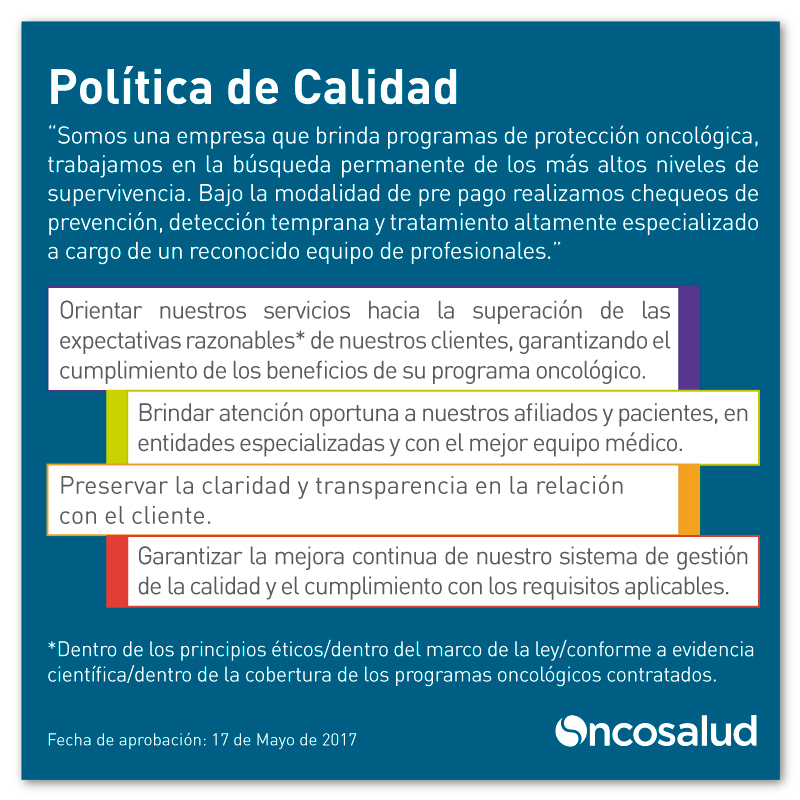 Vallejos C. Plan Nacional para la prevención, detección temprana y control del cáncer en Perú. National plan for prevention, early detection, and cancer control in Peru. Am Soc Clin Oncol Educ Book. 2013:245-8. Suazo J, Valdiviezo P, Flores C, Iberico J, Pinto J, Aguilar A, Vigil C, Gomez H, Vallejos C. Incidencia del Cáncer de Mama en una cohorte grande de mujeres afiliadas a un sistema prepago. Breast cancer incidence in a large cohort of Peruvian women affiliated to a pre-paid system. J Clin Oncol 31, 2013 (suppl; abstr e12570). Suazo J, Valdiviezo P, Flores C, Iberico J, Pinto J, Aguilar A, Vigil C, Gomez H, Vallejos C. Incidencia del Cáncer de Próstata en una cohorte grande de hombres afiliados a un sistema prepago. Prostate cancer incidence in a large cohort of Peruvian men affiliated to a prepaid system. J Clin Oncol 31, 2013 (suppl; abstr e12566). Pinto J, Flores C, Valdiviezo P, Velazco R, Garay M, Suazo J, Aguilar A, Gomez H, Vallejos C. Un sistema de puntuación basado en la expresión de los receptores tipo toll para predecir el pronóstico en los subtipos moleculares de cáncer de mama tratados con quimioterapia neoadyuvante (NAC). A score based in toll-like receptors expression to predict prognostic in molecular subtypes of breast cancer treated with neoadjuvant chemotherapy (NAC). J Clin Oncol 31, 2013 (suppl; abstr e22165). Pettengell R, Coiffier B, Narayanan G, de Mendoza FH, Digumarti R, Gomez H, Zinzani PL, Schiller G, Rizzieri D, Boland G, Cernohous P, Wang L, Kuepfer C, Gorbatchevsky I, Singer JW. Pixantrone dimaleato versus otros agentes quimioterapeuticos como tratamiento de salvataje de un solo agente en pacientes con Linfoma no-Hodgkin agresivo recurrente o refractario: estudio de fase 3, multicéntrico, abierto, randomizado. Pixantrone dimaleate versus other chemotherapeutic agents as a single-agent salvage treatment in patients with relapsed or refractory aggressive non-Hodgkin lymphoma: a phase 3, multicentre, open-label, randomised trial. Lancet Oncol. 2012 Jul; 13(7):e285. Balko JM, Cook RS, Vaught DB, Kuba MG, Miller TW, Bhola NE, Sanders ME, Granja-Ingram NM, Smith JJ, Meszoely IM, Salter J, Dowsett M, Stemke-Hale K, González-Angulo AM, Mills GB, Pinto JA, Gómez HL, Arteaga CL. El perfil molecular del cáncer de mama residual luego de la quimioterapia neoadyuvante identifica la deficiencia de DUSP4 como un mecanismo de resistencia a fármacos. Profiling of residual breast cancers after neoadjuvant chemotherapy identifies DUSP4 deficiency as a mechanism of drug resistance. Nat Med. 2012 Jul;18(7):1052-9. Gómez HL, Samanéz C, Campana F, Neciosup SP, Vera L, Casanova L, Leon J, Flores C, de Mendoza FH, Casteñeda CA, Pinto JA, Vallejos CS. Adición de amifostine al régimen CHOP en pacientes mayores con linfoma no Hodgkin agresivo: estudio de fase II que mostró una reducción de la toxicidad sin alterar la sobrevida a largo plazo. Addition of amifostine to the CHOP regimen in elderly patients with aggressive non-Hodgkin lymphoma: a phase II trial showing reduction in toxicity without altering long-term survival. Hematol Oncol Stem Cell Ther. 2012; 5(3):152-7. Gomez HL, Pinto JA, Schwarz JL, Vigil CE, and Vallejos CS. Variables medidas luego de la recurrencia en el Sistema Nervioso Central (SNC), excepto por el inmunofenotipo, identifican grupos de pacientes con cáncer de mama con una sobrevida más corta luego de la recurrencia en el SNC. Variables measured at Central Nervous System (CNS) relapse, but not Immunophenotype, identify groups of breast cancer patients with shorter post CNS-relapse survival. Cancer Res December 15, 2012; 72(24 Supplement): P6-07-20.